Auditors are entrusted with a variety of records and information either maintained by the agency or obtained during the audit process. Much of the information maintained by this agency is public and should be made readily available to those who request it. However, certain records including audit information are confidential, and the auditor is legally bound to protect the taxpayer's right to privacy. The Texas Government Code, Chapter 552, Public Information Act is the primary statutory authority for determining which records are public or confidential. The Act's general premise is that all information gathered by a governmental body is public, unless a law says otherwise. The Public Information Act is supplemented by provisions in the Tax Code pertaining to particular taxes, Open Records Decisions, Attorney General Opinions, and various judicial decisions. Detailed information regarding the agency's disclosure policies, procedures, penalties, etc. is outlined in the Agency Disclosure Manual. The information given in this manual is brief, and the Agency Employee Handbook should be consulted for more in-depth information on any topic or tax type. Every employee signs an EMPLOYEE AGREEMENT-CONFIDENTIAL TAX INFORMATION form (70-179) (see Exhibit I) certifying that the employee is aware of disclosure policies and fines. I understand that information concerning any taxpayer or vendor which may come to my knowledge while an employee of the Texas Comptroller's office is to be held in strictest confidence. I understand that no information disclosed in an audit, investigation, return, report or application filed by or on behalf of any taxpayer or vendor may be disclosed by me to any person except as provided in the Comptroller's Disclosure Policy. I understand that no federal return information obtained from either the taxpayer or the Internal Revenue Service may be disclosed by me except as provided by law. I understand that no protected health information obtained during a review of taxpayer records or otherwise may be used or disclosed by me except as provided by the federal Health Insurance Portability and Accountability Act (HIPAA) or other law. I further understand that all taxpayer information, vendor related information and information contained in personnel files is to be available to me only on a 'need to know' basis. I have read and understand the Comptroller's Summary Public Information Disclosure Manual, a copy of which has been made available and explained to me. While employed by the Comptroller, I shall not take any other employment which would directly or indirectly result in maintenance of records which are used in reporting to or filing reports with the Comptroller. Neither while employed by the Comptroller nor after leaving such employment will I represent any taxpayer or permit holder in any capacity before the Comptroller in connection with any audit, investigation, or action in which I participated personally and substantially while employed by the Comptroller (if applicable). While employed by the Comptroller and after leaving such employment, I agree to keep confidential all information, not otherwise open to the public under the Texas Government Code, Chapter 552, Public Information Act, pertaining to the Comptroller's internal operations and procedures confidential and not to use such information to the detriment of the Comptroller, the taxpayers, or the State of Texas. While employed by the Comptroller and after leaving such employment, I agree to keep confidential all information not otherwise available to the public under the Texas Government Code, Chapter 552, pertaining to specific taxpayers and permit holders, either about which I may become aware. I understand that any unauthorized disclosure or wrongful distribution of confidential information is either: (1) a misdemeanor punishable by up to 1 year in jail and/or up to a $1,000 fine (Texas Government Code, Section 552.352 and Texas Tax Code, Section 171.361); or (2) a Class B misdemeanor punishable by a fine of up to $2,000 and/or a jail term of up to 180 days (Texas Property Code, Section 22.27(c)). I also understand that the unauthorized viewing, use, or disclosure of federal tax information absent a strict need-to-know is either: (1) a felony offense punishable by up to 5 years in prison and/or a $5,000 fine for each offense and may subject an employee to civil damages (26 United States Code, Sections 7213, 7213A and 7431); or (2) a misdemeanor punishable by up to 1 year in jail and/or up to a $1,000 fine (Texas Tax Code, Section 111.007). Disclosure of federal tax information will result in immediate dismissal from employment. In addition, I understand that computer system password(s) I receive or devise are confidential. I will not disclose to any unauthorized person any password(s) which I am given or devise and I will not write such password(s) or post them where they may be viewed by unauthorized people. I understand that I am responsible for any computer transactions performed as a result of access authorized by use of my password(s). I agree to abide by all written conditions and restrictions imposed by the Agency Employee Handbook. I agree further to NOT to attempt to circumvent the computer security system by using or attempting to use any transaction, software, files or resources I am not authorized to use. I understand that use of a password not issued specifically to me or to a group of which I am a member is expressly prohibited. I also understand that failure to observe these restrictions constitutes a 'Breach of Computer Security' as defined in the Texas Penal Code, Chapter 33 sec. 33.02B, and that such an offense constitutes a Class A or Class B misdemeanor, or a state jail felony, and will result in my immediate dismissal. I understand that any copyrighted material, including but not limited to commercial computer software, which may be made available to me for my use as an employee of the Texas Comptroller's office is protected by copyright laws and is not to be copied for any reason without permission from the copyright owner. I understand that the violation of copyright laws, including computer software, may result in fines, imprisonment and/or immediate dismissal from employment. Nothing in this document shall be construed to change or affect the Comptroller's status as an 'at will' employer. The information contained in this document does not constitute terms of an employment agreement, nor does this document create a property interest in employment. The State of Texas Tax Code Sec. 111.004 authorizes the Comptroller or authorized agents to examine books, records, and papers of any person, firm, agency, or corporation permitted to do business in this state. Section 111.006 establishes the confidentiality of all information obtained during the course of an examination of a taxpayer's books, records, or business activities. These general provisions apply to all taxes, fees, and funds administered by the Comptroller; however, more specific record requirements, authority to examine the taxpayer's records, and confidentiality provisions can be found in many of the individual tax laws. Confidentiality can be betrayed without intent through carelessness. Although unintentional, this disclosure is very serious. To prevent this while the auditor is at the taxpayer's location examining records, the auditor should use caution in leaving any sensitive or confidential information unattended. For example, audit leads, information pertaining to other taxpayers, or federal information is confidential and must not be left unattended or unsecured. The auditor should also secure computer disks and work papers when leaving the area, i.e., for lunch, breaks, etc. The auditor should also lock briefcases and automobiles when they contain audit files or other confidential information and are left unattended. The auditor also needs to 'lock' his computer when away from the work area at the taxpayer's location while pulling records, taking a plant tour, etc. When it becomes necessary to remove records from the taxpayer's premises for examination, a Receipt for Taxpayer Records should be prepared. (See Exhibit II.) The auditor enters the necessary information onto CATS/Audit Doc/Supplementary Information. The auditor should sign the receipt, give the original to the taxpayer, and the auditor should keep a copy. Records must be returned to the taxpayer intact and complete when the examination is completed, and the auditor should obtain the original receipt for records. 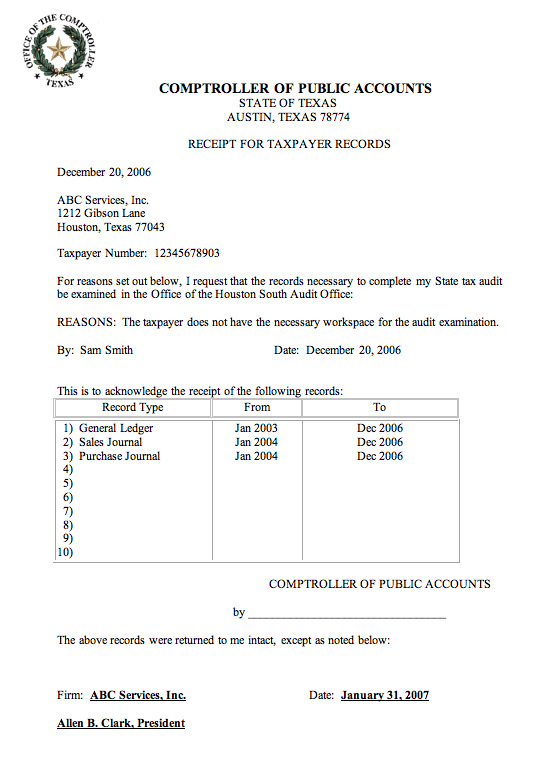 The taxpayer signs the original receipt acknowledging that the applicable records were returned in good order. While taxpayer records are being examined in the field office, appropriate safeguard measures must be exercised. Confidential information must not be left unattended or in open view. Records must be secured when leaving the work area for any reason. Briefcases, desks and file cabinets must be locked when leaving the office for an extended period of time. Locking file cabinets containing confidential information must be clearly marked by displaying a warning notice on the cabinet. Confidential information should never be placed in file cabinets which cannot be locked and secured. The auditor must not reveal to the taxpayer the source of the audit lead or information leading to the generation of the audit. Audit leads, sources of information, and informants are confidential under the provisions of Sec. 111.006 of the General Provisions of the Tax Code, Public Information Decisions #127, #156, and #172, and Art. 6252-17a, Sec. 3(a)(1) of the Public Information Act, and various judicial decisions. The Comptroller must not disclose information to an informant which is deemed confidential under Sections 111.006, 151.027, or 171.706 of the Tax Code (Attorney General Opinion #JM-916). Some requests for information must be handled under the Public Information Act, and there is sometimes a fee involved in providing the information. For more details on this area, refer to the Employee Handbook. Frequently a taxpayer's attorney, CPA, or other representative will need to discuss the audit with the auditor. Since the audit procedures and results are confidential, a Power of Attorney or letter of authorization from the taxpayer should be obtained before discussing the audit with the taxpayer's representative. The Audit Questionnaire is not sufficient if the taxpayer's representative is not an employee of the company. Auditors often receive requests for information from persons other than the taxpayer or authorized representative. For example, a taxpayer may request copies of hearing decisions, position letters, taxability responses, and correspondence which deals with other taxpayers. Such information may be released to the requester after it has been properly edited. When a request for confidential information is received from an outside agency or individual (an attorney, CPA, credit organization, lending institution, etc.) the request should be forwarded to the office manager. If an auditor is served with a subpoena for the discovery of confidential information on a taxpayer, the employee should immediately contact the supervisor/manager. Additional editing may be necessary to ensure that information released does not give an advantage to competitors or bidders, that the recipient cannot 'back into' the amount of tax paid by any taxpayer, or allow the reader to determine the taxpayer's identification, financial situation, or business operations. Auditors occasionally receive IRS and Treasury information as a part of the audit examination. Federal information is confidential and must be very carefully safeguarded to protect the confidentiality of the documents. Notes and summaries made from the documents are as confidential as the documents themselves. Federal documents, and any notes and summaries made from the documents, must be maintained in a folder separately from the audit package. This folder must be clearly marked 'CONFIDENTIAL.' The federal documents, notes, and summaries must not be sent to the Processing Center and/or Audit Headquarters with the audit package. These must remain in the audit office in a separate folder until the auditor no longer needs them. When the federal documents are no longer needed, the auditor should return them (and all notes and summaries made from them) to the Assistant Disclosure Officer for Audit Division. The federal documents should be placed into a sealed envelope addressed to the Assistant Disclosure Officer, and clearly marked 'CONFIDENTIAL. TO BE OPENED BY ADDRESSEE ONLY.' The documents should be returned to the disclosure officer using intra-agency mail. Federal information may be disclosed in a Comptroller's Administrative Hearing or to the Attorney General's Taxation Division only after the Agency Disclosure Officer has approved release of the information and has properly notified the IRS of such action to be taken. If an audit containing federal tax information is sent to Legal Services for a redetermination hearing, Legal Services Division must place the audit in a file folder stamped 'Contains Confidential Federal Tax Information.' The audit file should be maintained under strict security in locked file cabinets and secured when left unattended. For more detailed information on safeguarding federal tax information, please refer to the Comptroller's Open Records Disclosure Manual - Internal Revenue Service Information. EDITED Audit Plans may be released to the taxpayer being audited. A written request to the Agency Disclosure Officer is required from the taxpayer. In general, all reported data on taxes, fees, and funds is public information. The sales and franchise tax statutes, however, specifically make reported data for these tax types confidential. Refer to the Agency Disclosure Manual for details on the various tax types.